The serious conversation about campus “police” brutality will continue below, but for those of you looking for a little Sunday morning light entertainment, see Amanda Krauss, the Worst Professor Ever, on the feminism of Parks and Recreation and the overall awesomeness of Ron Effing Swanson, man’s man and feminist icon. Julia and Bix covered one point I was going to add. 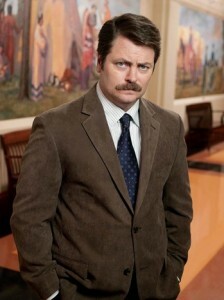 So, I’ll just say: I have always loved Ron Swanson and the latest episode made me love him even more. Made of *win*. I loved the last few seconds when Andy (good natured, but clueless) sat right in the front row and held forth about “the wimminz.” I also am looking forward to more P&R Women’s Studies class!! OMG, we laughed until we cried chez Perpetua as Andy, Ron, and Andy’s wife (it’s a post on feminism and pop culture and I can’t remember the name of the female character!) were moved deeply by the women’s studies professor. It was awesome. I often compare P&R to 30 Rock (because there’s so much criticism of Liz Lemon’s “feminism” on that show vs P&R where the feminism is everywhere). I watch all my TV shows on hulu. I can’t imagine ever watching evening network tv like I used to.